"A corrupt judge in a mob murder case. A disillusioned pastor, hungry for power. A cynical reporter, sniffing for a scandal. A gambling addict whose secret tape threatens the lives of everyone who hears it. New York Times bestselling author Lee Strobel weaves these edgy characters into an intricate thriller set in a gleaming, suburban megachurch, a big-city newspaper struggling for survival, and the shadowy corridors of political intrigue. 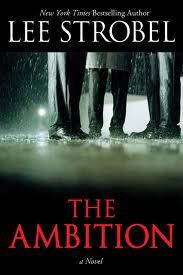 The unexpected climax is as gripping as the contract killing that punctuates the opening scene." What we thought: I really enjoyed this gripping suspense novel. I love how the tale switches between the points of view of all the characters to disclose the full story. Strobel's writing style is intense and intriguing in this hard-to-put-down page-turner. Great characters and an intricate storyline make for a really great summer read. ABCD Diaries gives The Ambition an A+! Buy It: Find this book at your favorite book dealer starting May 17th.